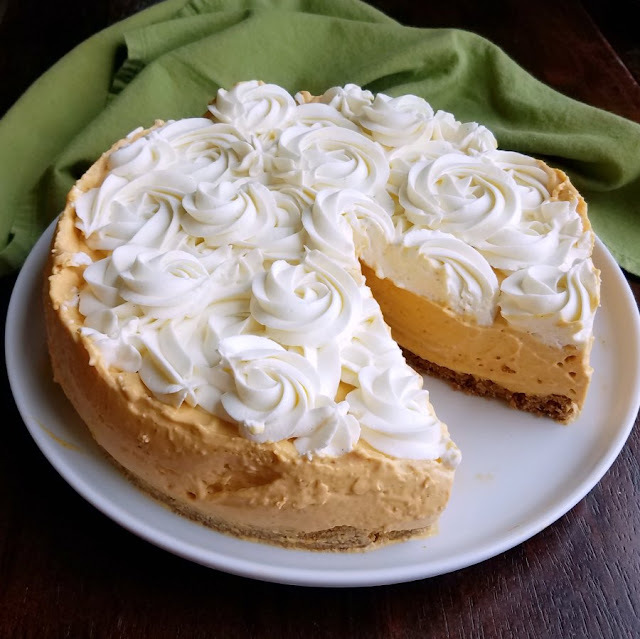 No bake pumpkin cheesecake is a showstopper dessert that is easy to make and has a great pumpkin flavor. Soft and airy pumpkin filled no bake cheesecake is the perfect transitional fall dessert. It's also great for the holidays when your oven is full of other things. 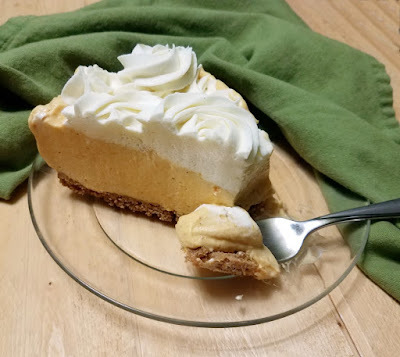 It has a nice pumpkin spice roundness to it and the vanilla cheesecake topping takes it to the next level! This cheesecake has the perfect balance of flavors. You can really taste each of the components. There is enough pumpkin that you can really taste it, but not so much that you can't also taste the cream cheese. Then there is just enough pumpkin pie spice to make your taste buds dance. I made my crust with some delicious ginger graham crackers that really added another layer of flavor. Regular grahams, cinnamon grahams or gingersnaps would also be great options. Brown sugar was my sugar of choice here because of the warm flavor it adds. I really love it in fall desserts. Luckily Dixie Crystals hooked me up, so I'll have plenty to get me through all of the fall baking to come. The filling whips up fast. Being a bit lazy and hating to do more dishes than I have too, I actually whipped up the topping first. Then I spooned that into a piping bag and used the same bowl to make the filling. In just a few minutes the whole thing was done. Piping the topping on had two advantages. The first is it looks pretty, the second was it kept me from having to spread it over the loose filling. If you'd rather spread the topping on, do so gently. Or better yet, you could chill or even freeze the filling for a couple of hours first to make the job a bit easier. The flavor and texture of this beauty was delicious. All of that pumpkin can make getting perfect pieces a bit of a challenge though, especially if you are impatient like me. Ideally you would let your cheesecake have a nice long chill time to set up. Six to eight hours should do it, overnight would be even better. If you're impatient like me, I would recommend freezing the cheesecake until you are ready to serve it. It will make the serving process go smoother and it softens back up quickly. I test froze a few pieces and they delicious straight from the freezer. 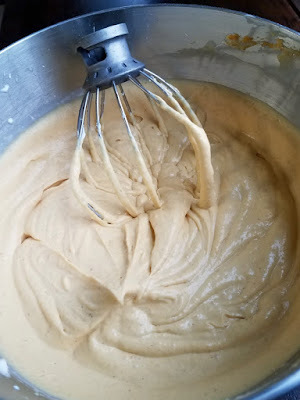 Another option would be to use pumpkin butter instead of puree. With a lower water content, it would make for a thicker final product. This cheesecake isn't super sweet, so the extra sugar content wouldn't be overwhelming. You could always scale back on the sugar a bit if you were worried about it though. I was surprised when my non pumpkin loving husband asked for a slice after a big dinner. He usually will double up on meat and skip dessert when given the choice. Even he was impressed! My dad asked for a few leftover pieces to be left with him as well, so I'd say it was a hit all the way around. I'd be sad it disappeared as quickly as it did, but it just gives me more excuses to make something new! To make this completely no bake, you can just firmly pat the crust together. The butter in the crust and the filling will hold it together pretty well. If you want it to be a firmer crust, pop it in a 350F oven for about 10 minutes, then cool it completely before proceeding. You don't want to rush the chill time, give it a nice long time to set in the refrigerator. If you don't have at least 6 hours to chill the cheesecake, stick it in the freezer for a couple of hours instead. Run a plastic knife between your springform pan and the edge of the cheesecake before releasing the pan. This will give you a cleaner edge. 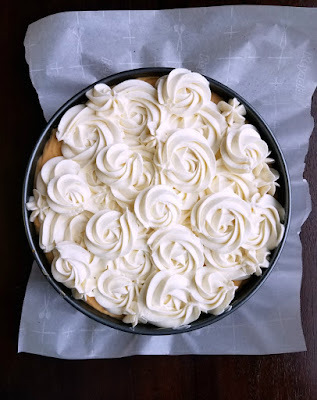 If you want to serve the cheesecake on a platter instead of on the bottom of the springform pan, build the crust on top of a piece of parchment paper. That will make transferring it off the pan easier. If using this method, be extra sure the cheesecake is firm before trying to make the move! Some chopped pecans or a drizzle of caramel (or both!) would be lovely garnishes if desired. If you want to be able to move the cheesecake off the base of the pan, line the bottom of a 9" springform pan with parchment paper. If not, just build the crust right on the bottom of the pan. Dump cookie crumbs into the pan. Stir in 2 Tablespoons brown sugar. Melt the butter and mix with the cookie crumbs. Press to form an even and well packed crust across the bottom of the springform pan. Bake to set if desired, otherwise set aside. Beat 16 ounces of softened cream cheese until smooth and fluffy. Add the sugars, pumpkin, vanilla and pumpkin pie spice. Whip until well incorporated. While beating, slowly drizzle in cold cream. Beat on high until light and fluffy, at least 5 minutes. Spread filling over prepared crust. 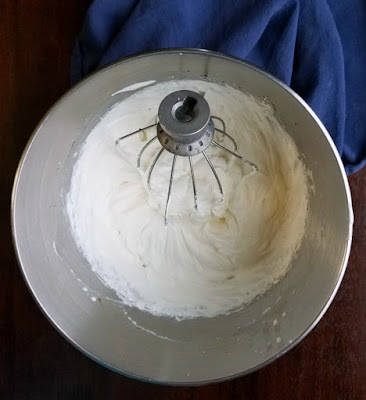 Beat 8 ounces of softened cream cheese until smooth and fluffy. Add the sugar and vanilla, beating until combined. While beating, slowly drizzle in cream. Beat on high until light and fluffy, about 5 minutes. Spoon into piping bag and pipe over filling if desired. Otherwise gently spread over filling. Chill prepared cheesecake for at least 6-8 hours or freeze for at least a couple of hours. Cut with a sharp knife, dipping in hot water between slices for the cleanest cuts. So pumpkin perfect. 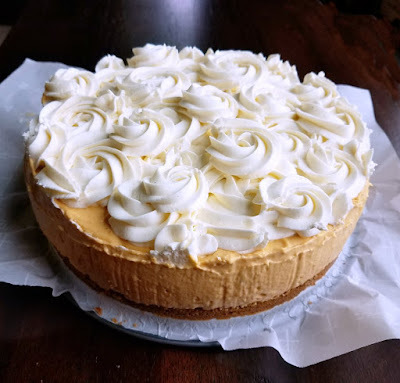 I have made pumpkin cheesecakes before and I just love them and the creamy texture. Your recipe sounds amazing! 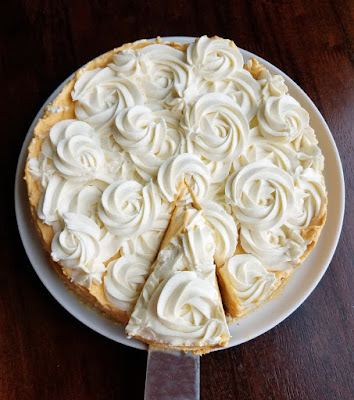 I need to make a classic pumpkin cheesecake for the blog sometime, but this no bake one was definitely a hit! Hi Carlee, Oh I do fancy this. The thought of a vanilla cheesecake tpping on a smooth filling appeals to me and I using pumpkin kind of intregues me too. Us brits tend to think pumpkin as a savoury dish. The downside is thatpumpkins aren't going to be showing their pretty orange selves for a while yet and we don't get pumpkin puree!... As for pumpkin spice? I'd have to find a recipe...Maybe one day. Oh my goodness. It would be soooo much fun to take you to our grocery stores, though it would probably be overwhelming. I need more savory pumpkin dishes in my recipe box so you could help me that way! Carlee, that is a beauty!! Now I feel like fall is here!! As you know, we love all things pumpkin and this is no exception. This no bake cheesecake sounds sooo good. I'm glad that your hubby liked it. I was surprised by happy about that too! That is a beautiful cheesecake, Carlee! Thanks so much for sharing your post with us at Full Plate Thursday and hope you have a great week! So much deliciousness from you, I don't know what to make first! Congratulations on the feature at Happiness is Homemade! I would NOT be able to resist more than one piece of this. 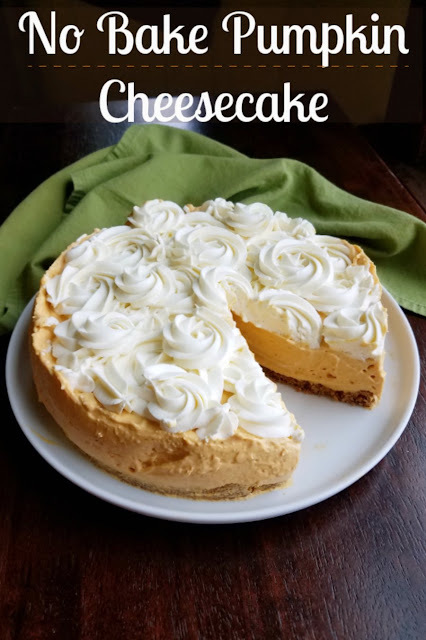 :-o Cheesecake is one of my favorite desserts and pumpkin cheesecake sounds even more irresistible! Thanks so much for sharing this with us at the Whimsical Wednesdays Link Party. Have a great week! It's hard, it just begs you to have a little bit more!